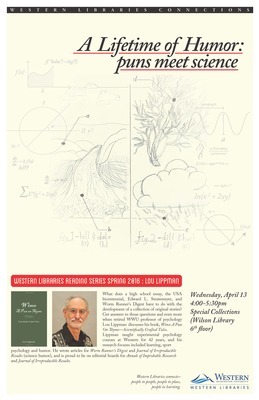 WWU Emeritus Professor of Psychology Louis Lippman presented “A Lifetime of Humor: Puns Meet Science,” as part of the Western Libraries Reading Series from 4-5:30 p.m. on Wednesday, April 13th in Special Collections (Wilson Library 6th Floor). What do a high school essay, the USA bicentennial, Edward L. Stratemeyer, and “Worm Runner’s Digest” have to do with the development of a collection of original stories? Get answers to those questions and more when Lippman discusses his book, Wince A Pun on Thyme, a unique collection of 176 original vignettes, each culminating in a pun or spoonerism. The stories are unrelated to one another and with few exceptions, are not longer than a single page, making the book ideal for people with limited reading time or for those who seek small doses of levity. The book also features a foreword that describes how an intuition about enhancing the humor value of fables led to a series of empirical studies. Lippman taught experimental psychology courses at Western for 42 years, and his research focuses included learning, sports psychology and humor. He wrote articles for Worm Runner’s Digest and the Journal of Irreproducible Results (science humor), and is on editorial boards for the Annals of Improbable Research and the Journal of Irreproducible Results. This event was offered as part of the Western Libraries Reading Series, dedicated to showcasing the scholarly and creative work of Western faculty by featuring diverse speakers from a variety of backgrounds and disciplines who are engaged in research, writing, and teaching at Western. Please note there is supplemental content at the bottom of the page which will be used during the presentation. Handout on Swifties and Puns for use during reading.